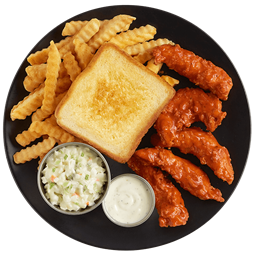 Providence Food Delivery - Lunch & Dinner Delivery Service Zaxby's Chicken - Order Online! Chicken Fingerz™, Crinkle Fries, Texas Toast, Cole Slaw, Zax Sauce®, and a 22oz Drink - hey, when you're good, you're good. Buffalo Chicken Fingerz™, Crinkle Fries, Texas Toast, Cole Slaw, Ranch Sauce, and a 22oz Drink - hey, when you're good, you're good. You don't have to make a choice between hand-breaded goodness and finger-licking deliciousness. Chicken Fingerz™, Boneless Wings, Crinkle Fries, Texas Toast, Zax Sauce®, Ranch Sauce, and a 22oz Drink. So overloaded with flavor, we didn't have room for the 'c.' Chicken Fingerz™, Texas Toast, Zax Sauce®, served with Crinkle Fries, and a 22oz Drink. All the flavor, none of the obstructions. Five of our tender, tasty Boneless Wings, Texas Toast, Celery and Ranch Sauce, served with Crinkle Fries, and a 22oz Drink. Traditional but never boring. Mixed greens, red cabbage, carrots, cucumbers, Roma tomatoes, cheddar and Jack cheeses, fried onions, and Chicken Fingerz™ with Texas Toast. Mixed greens, red cabbage and carrots topped with Chicken Fingerz™, Roma tomatoes, cucumbers, bacon, hard-boiled egg, fried onions, cheddar and Jack cheeses with Texas Toast. Served with Lite Ranch Dressing. This one's got all your usual suspects, but with a kick of Zaxby's flavor. Mixed greens, Parmesan cheese, bacon, croutons, and Chicken Fingerz™. Served with Caesar Dressing. Mixed greens, red cabbage, carrots, Roma tomatoes, blue cheese crumbles, fried onions, and blackened chicken with Texas Toast. Served with Mediterranean Dressing. Chicken Fingerz™, Zax Sauce®, crisp lettuce, and tomatoes on a toasted Brioche bun, served with Crinkle Fries and a 22oz Drink. Chicken Fingerz™, Zax Sauce®, crisp lettuce, and tomatoes on a toasted Brioche bun. It's our famous chicken…with a kick. (See what we did there?) Chicken Fingerz™, Ranch Sauce and Tongue Torch® on Texas Toast, served with Crinkle Fries and a 22oz Drink. It's our famous chicken…with a kick. (See what we did there?) Chicken Fingerz™, Ranch Sauce and Tongue Torch® on Texas Toast. Not living the fried life? Try this favorite with grilled chicken, Honey Mustard Sauce, tomatoes, and crisp lettuce on a toasted Brioche bun, served with Crinkle Fries and a 22oz Drink. Not living the fried life? Try this favorite with grilled chicken, Honey Mustard Sauce, tomatoes, and crisp lettuce on a toasted Brioche bun. Can't beat the taste of home. Made with tender, all-white-meat chicken on honey wheat bread with crisp lettuce and juicy tomatoes, served with Crinkle Fries and a 22oz Drink. Can't beat the taste of home. Made with tender, all-white-meat chicken on honey wheat bread with crisp lettuce and juicy tomatoes. Delicious and downright adorable. Three snack-sized Nibblerz®, served with Crinkle Fries and a 22oz Drink. Chicken Fingerz, bacon, crisp lettuce, tomatoes, mayonnaise, and American Cheese on Texas Toast, served with Crinkle Fries and a 22oz Drink. Chicken Fingerz, bacon, crisp lettuce, tomatoes, mayonnaise, and American Cheese on Texas Toast. Blackened chicken, bacon, crisp lettuce, tomatoes, Ranch Sauce, and American cheese on a toasted Brioche bun, served with Crinkle Fries and a 22oz Drink. Blackened chicken, bacon, crisp lettuce, tomatoes, Ranch Sauce, and American cheese on a toasted Brioche bun. All the flavor, none of the obstructions. Our tender, tasty Boneless Wings, served with celery and Ranch Sauce, tossed in the sauce of your choice. Order them to share, or to keep them all to yourself... we won't judge. Our Traditional Wings, served with celery and Ranch Sauce, tossed in the sauce of your choice. Hand-breaded on the outside, tender on the inside, they're like the bad boy who is secretly the big ol' softie of our menu. Served with Zax Sauce®. Cooked to perfection, tossed in the sauce of your choice and served with celery and Ranch Sauce. Because we knew you'd love it. Batter-fried white cheddar cheese pieces with marinara dipping sauce. Bite-sized gooey, cheesy goodness? Yes, please! Batter-fried onion rings with our Zestable® dipping sauce. Snatching the last one is not only allowed, it's encouraged. Batter-fried mushroom pieces with our Zestable® dipping sauce, for when your taste buds could use a wake-up call. Thin-sliced fried potatoes with Ranch Sauce. You may never settle for bagged chips again. Think outside the bag with our deliciously crunchy Tater Chips served with Buffalo Chicken Dip. Chicken Fingerz™, Crinkle Fries, Zax Sauce®, Kidz® Drink, and a Treat. Yum yum in the tum tum. Bite-sized for the pint-sized. One of our classic Chicken Fingerz™, tucked in a toasted bun and topped with Zax Sauce®, served with Crinkle Fries, Kidz® Drink, and a Treat. Grilled cheese, Crinkle Fries, Kidz® Drink, and a Treat. Lunchboxes everywhere are green with envy. Sweet, creamy and dreamy. Diced cabbage and carrots mixed with our signature coleslaw dressing. Can't beat the taste of home. Made with tender, all-white-meat chicken, enjoy a side of our Chicken Salad. Bowtie pasta with Parmesan cheese and fire-roasted vegetables, mixed with a zesty signature dressing. 3 pieces of our thick-cut toast grilled with our signature garlic spread. Crispy, crinkle-cut fries with our signature seasoning salt. Nom, nom, nom. Try the lighter side of sides. Fresh salad greens, with red cabbage and carrots, topped with Roma tomatoes and cucumbers, served with your choice of dressing. Chicken Fingerz™, Texas Toast, and Zax Sauce®. Hand-breaded on the outside, tender on the inside, its like the bad boy who is secretly the big ol' softie of our menu. Stop a snack craving in its tracks with one of our classic Chicken Fingerz®, tucked in a toasted bun and topped with Zax Sauce®. This is the one that put us on the map. A creamy blend of zesty spices whose tangy taste was custom-made for Zaxby’s® delicious Chicken Fingerz™. Because it's your birthday… sometime this year! The creamy flavor of cake batter blended with festive sprinkles into a delicious frozen treat, complete with chocolate whipped topping. The taste of rich chocolate blended with chunks of crushed chocolate cookies and topped with whipped cream. So it's like a chocolate milkshake, but with cookies. Making it 126% better. That's science. Just like mom used to make, only better. (Sorry, mom.) Fresh-baked cookies of the Chocolate Chip, White Chocolate Macadamia and Oatmeal Raisin persuasion. A freshly baked, deliciously tempting brownie made with chocolate chunks. No, you can't lick the bowl!